Mickey's Magical Christmas: Snowed in The House of Mouse (at the number 7 spot). Hollywood character actor Otis Harlan is born in Zanesville, Ohio. He supplied the voice for Happy in Disney's classic 1937 film Snow White and the Seven Dwarfs. famous animal photographer Alfred G. Millote). Today is Circus Day on the ABC-TV series Mickey Mouse Club. forcing the Magic Kingdom to close to outside visitors for 4 hours. voice of Shang) and his latest CD "What I Meant to Say" (his 54th studio album). Time magazine features a review of Disney's recently released animated feature Dumbo. The report includes the review and a paragraph focusing on animator's Bill Tytla's work. was The Incredible Mr. Limpet (1964), a comedy mixing live action and animation. to Pete Martin (a "celebrity friendly" writer) appears in the Saturday Evening Post. and the third vice president to become a president upon the death of a sitting president. Visit him and all the U.S. Chief Executives at Disney World's The Hall of Presidents. Country music singer Jessica Andrews is born in Huntingdon, Tennessee. the Disney-owned Lyric Street Records. An amazing 69,458 guests visit Disney World on this day! sort of inland, so I had a survey group go out and hunt for areas that might be useful." be generally released in January. Singer, songwriter, musician and actor Ross Shor Lynch is born in Littleton, Colorado. and Girl Meets World, and the Disney Channel Original Movies Teen Beach Movie and its sequel Teen Beach 2.
songs for the film Teen Beach Movie. 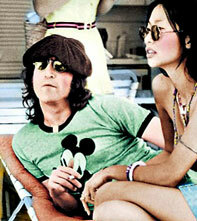 Florida for Lennon to approve ... as the other 3 Beatles have already signed. the newly created 55-year Snow White-themed service award. both the 2007 National Treasure: Book of Secrets and 2004 National Treasure, and Mr. Sir in the 2003 Holes. 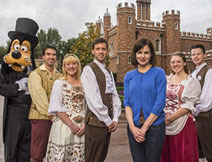 Actress Elizabeth McGovern visits Walt Disney World. Currently enjoying success on the series Downton Abbey, she stops for a photo at Epcot that parodies the hit show. McGovern (who portrays Cora Crawley) poses with Disney cast members in front of Epcot's United Kingdom Pavilion, which is meant to represent Highclere Castle, the historical building used in Downton Abbey.